Dennis Kimetto set the world record of 2:02:57 and Shalane Flanagan came up short in her quest to break the American record. 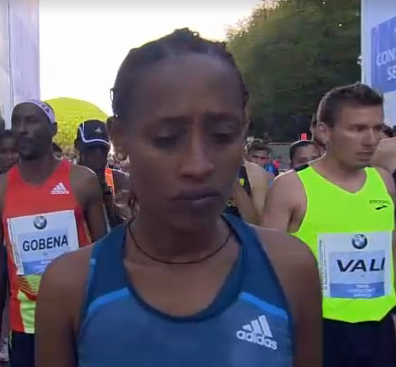 Sunday’s Berlin Marathon, the first major of the fall, was chocked full of storylines. Here are 26 thoughts on the first major marathon of the fall. 1) As soon as Kimetto ran 2:04:16 in his debut in 2012 we should have known this was possible. It was his first competition and like any newcomer, the PRs come pretty easily in the beginning. After his Chicago course record last fall, it was reported that he only had been running for four years. How many runners hit their peak in just four years of running? Not many. I’m not sure why we expected anything different from Kimetto. I was scared off of predicting the world record in large part due to his DNF at Boston in the spring. But running in the hills of Boston is almost a completely different event than what happens in the 26 miles of Berlin. 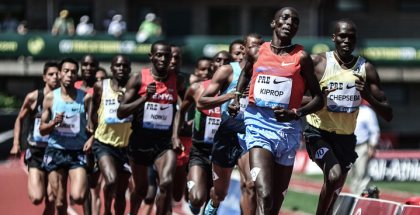 The controlled pace and flat course played to Kimetto’s strengths and he took full advantage. 2) Before the start, the commentators said the race “Could not have had more perfect conditions.” The temperature was cool and there was no wind. Keep this in mind when discussing the ramifications that Kimetto’s run has on the possibility of a sub-two hour marathon. The weather, the pacing, the course and the competition were all perfectly suited for a record attempt. 3) The last one (competition) played a vital role in the record. Unlike Wilson Kipsang last year, Kimetto had people to run with into the late stages of the race. Even after the record was a formality, there was genuine uncertainty about who would win the race with Kimetto and Mutai both looking like they had enough in them to outlast the other. Building a world record attempt around one person has been done in the past, but I think that strategy is going to prove less and less effective now that the record is under 2:03. A race with just Kimetto and rabbits would not have been nearly as fast, and certainly not as fun to watch. Any further record attempts will need to have a deep field along with the requisite pacing and weather. 4)This bears repeating. If anyone knows Dennis, please pass this message along. 5) Shalane Flanagan followed her plan and hit halfway in 1:09:38, a quick pace, yet not too far out of range if she wanted to run the American record. She got passed by two women in the second half of the race and finished in 2:21:14. That is a personal best and the second faster American time ever in a marathon. We knew she was going to run aggressively and, much like in Boston, she chose the most logical strategy available to her. In Boston that meant pushing the pace and trying to whittle down the group. On Sunday, it meant grinding out even splits in order to break to 2:20. Both strategies were the correct ones, even if neither produced the desired outcome. Going out in 1:10 or 1:11 for the first half on Sunday, might have given her a faster finishing time, but she still would have come up short of Deena Kastor’s American record. 6) Lost in the world record/American record shuffle was the winner of the women’s race, Tirfe Tsegaye. She cruised by Flanagan and set a personal best of 2:20:18. Boru Tadese was second in 2:20:27. I had no idea these two were only nine seconds apart. 7) The mixed gender races made for an interesting viewing experience, especially when each woman was encircled by a male entourage for the majority of the race. In the early miles, it was difficult to see anyone other women beside Flanagan. Kayoko Fukushi was running with Flanagan’s posse, but all the others were with their own set of male pacers. From afar, it looked like they were all running their own private races, unaffected by the usual rhythms of competition. Running with men leads to faster times (although the women’s times weren’t that fast in Berlin compared to other courses), however I think it gives them short shrift on the television coverage. When they start 20-30 minutes ahead of the men, like they do in Boston and New York, it resembles and actual races and viewers don’t lose sight of them amidst a sea of men who are trying to run 2:20. 8) I thought setting the American record was actually a harder goal for Flanagan than winning the race. Tsegaye’s winning time shows just how tough a sub 2:20 time is to accomplishment. It also makes you realize how remarkable Deena Kastor was during her American record run in 2006. With times dropping all over the world and the depth increasing in women’s running, she is still 15th on the all-time list. 9) Kimetto now has the world record and three major marathon wins. But he has never beaten Meb Keflezighi. Meb always wins. 10) Wilson Kipsang’s response to having his record taken away? 11)Emmanuel Mutai smashes the world record, but Kimetto manages to go faster. Last fall, he ran under 2:04 in Chicago only to place second. And he has more stories like that…. Sunday was Mutai’s seventh time finishing second in a major marathon. It’s not that he just gets second a bunch, it’s that he does it in races that are historically fast. Like in Chicago, he pushed Kimetto over the final miles. Remember it was Mutai who made that initial surged when the rabbits dropped out at 30K that led to the quad numbing 14:09 5K. Without Mutai, there is no way Kimetto sniffs 2:02. If you told Mutai before the race that he would run 2:03:13 and finish second he absolutely would have believed you because this is exactly how his career has gone. He has won a major marathon, but he has also been in the background for so many amazing marathon moments in the last six years. 13) My fall marathon preview already needs some revision. Kenenisa Bekele and Eliud Kipchoge looked to have a shot at the world record in Chicago next month. But that was 26 seconds ago. Now that it is in the 2:02s I think the chance of that happening is all but gone. I probably shouldn’t be so quick to count another world record out this fall. Last year we didn’t think Chicago could touch the new Berlin Marathon record and Kimetto was only 22 seconds away. 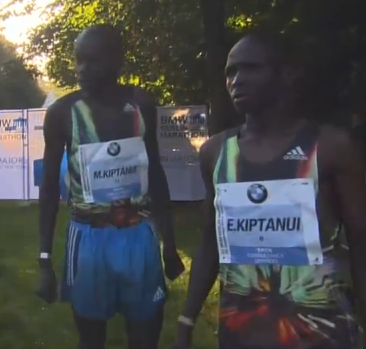 Perhaps the 2:02:57 by Kimetto will provide a psychological boost to the men in Chicago. 14) Abera Kuma placed third in the men’s race with a time of 2:05:56. Prior to Sunday, his marathon personal best was 2:09:53 from Dubai, which translates probably to 2:30 something on an actual course. Berlin was only his third marathon ever so keep an eye on him in the future, especially as Ethiopia looks for someone who can consistently challenge the Kenyans. Prior to Sunday, Kuma was probably best known for getting into a fight during the 2011 IAAF Cross Country Championships. 15) Kimetto may have also wrapped up the IAAF Athlete of the Year with his performance. We’ve been back and forth on this topic before and explained how there really is no clear winner for either the men’s or women’s award. It’s hard to compare someone who runs twice a year with another athlete who has a season’s full of performances and yet, marathoners are eligible to win the award. 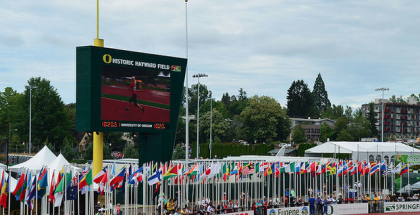 Kimetto’s 2014 is the ultimate feast or famine–DNF in the spring and then a world record in the fall. In the absence of a front runner, he has just as good of a case as Renaud Lavillenie, Justin Gatlin, Mutaz Essa Barshim or Bohdan Bondarenko. I don’t see much resistance with giving it to the first man to break 2:03 in the marathon. A marathoner has only won the award once–Paula Radcliffe in 2002 when she ran a world record of 2:17:18 in Chicago. Haile Gebrselassie won in 1998, but that was when he was still running on the track. 16) Kimetto has got this pacing thing down. Or he is just really good at following pacesetters. He was 61:52/61:53 in Chicago. On Sunday he was 61:45/61:12. After the rabbits dropped out at 30K, he dropped at 14:09 5K with the help of Geoffrey Kaworor and Emmanuel Mutai. All of Kimetto’s other 5K splits were between 14:46 and 14:26. 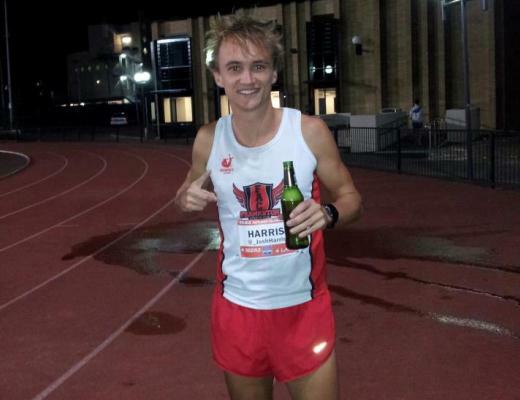 His 1:01:12 is the 84th best half-marathon time of 2014. The best American half-marathon time of the year is 1:01:33 by Josphat Boit. 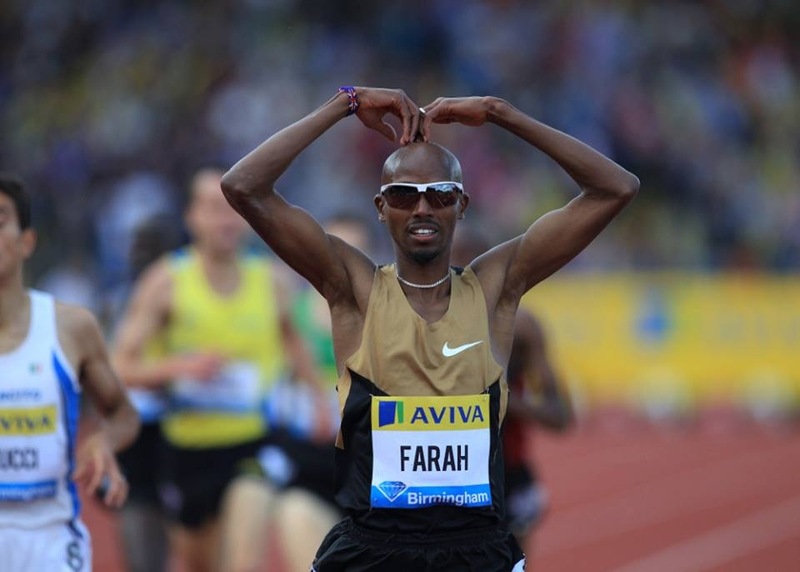 Mo Farah and Kenta Muryama are the only non-Africans to have run faster half-marathons this season. Commence the rest of the world feeling bad about themselves! 17) That’s not how you spell Ryan Vail’s name. Rabbits get no respect. 18) Geoffrey Kaworor, formerly Geoffrey Kipsang, hung around until 33K and look poised for his marathon breakthrough. Then the last 11K happened and he drifted back into fourth place and lost over three minutes on Mutai. He finished in 2:06:39 giving him three straight years of finishing in in the 2:06s in Berlin. He is still relatively new to the distance and as we saw with Stanley Biwott, if you put yourself with the lead group enough eventually you’ll be able to hold it together for the final miles. 19)Why did the rabbits and Kimetto/Mutai have to wear the same black and white color scheme? When the pacers dropped at 30K the commentators thought it might be Kimetto who had a problem. I’m chalking that up to the the similar look of the jerseys. It’s not like Adidas didn’t have other athletes in the race wearing different kits. What did those guys wear? Oh. Nevermind. Let’s stick with black and white. 20) If Berlin was any indication, the fall marathon season will be spectacular. The women’s fields only get stronger and the men’s races have plenty of interesting subplots between the Chicago and New York. Geoffrey Mutai trains with Dennis Kimetto so if he has been anywhere near him during their daily workouts he should be in great form for his New York title defense. 21)Before the halfway point, Tsegaye Kebede dropped off the lead group. When he didn’t reappear later in the race it came as quite a shock for anyone who has been following his career. He’s fallen off the pace before, but usually he manages to claw back into the top five. Sunday he slowed considerabley in the second half and finished 9th in 2:10:57. That is his worst finish in a major in his career. Seven years is a long time to be at the top for an elite marathoner. Perhaps this is the first sign of a slowing Kebede. He’s dealt with fast paces before and clearly he wasn’t in form for this race. 22) Most people agree, there isn’t enough going on during a major marathon. Between the thousands of runners, hundreds of thousands of spectators, elite racers, charity runners it can get a bit dull. The inline skating marathon! At first when I saw this on the screen I thought I was hallucinating due to lack of sleep. 23) Kimetto covered the final two kilometers in 6:28–just one second slower than he closed in Chicago last year. Wilson Kipsang ran that same segment during his world record in 6:11. If there is room to improve the new world, that is one place where you can look. However, energy expended in one part of the race means another area will have to suffer. That 14:09 5K split between 30K and 35K took a lot out of Kimetto, but it also put him in position to get the record. 24) Unless someone runs out of their mind in New York or Chicago, Shalane Flanagan will remain the clear number one female marathoner in the United States. She has held that title since she debuted at the distance in 2010. During that same period, the American men’s title has bounced back and forth several times between Meb Keflezighi and Ryan Hall. 25) Kimetto’s win gets him closer to winning the World Marathon Majors title and the $500,000 prize that goes with it. Wilson Kipsang is the only runner remaining who can overtake Kimetto and he needs to win in New York City to surpass him. Add that to the list of things to watch for in New York. So what time would Kipsang or Mutai (or someone else) have to run in New York to be the equivalent of that 2:02:57? One calculator I found came ups with a 2:04:50 which would be an impressive time, but I would think those two can do better. Mutai’s 2:05:05 course record in 2011 was one of the most impressive marathon performances I’ve ever seen and was probably a world record effort. That time was 1:27 off Makau’s 2:03:38 record from the Berlin marathon earlier that fall. So maybe, another 1:27 on top of Kimetto’s time for a 2:04:24. But I think Mutai and Kipsang are potentially capable of 2:03 high if the conditions are right and they are both going for it the whole way. Ultimately though I think it is often the strategic nature of the race in New York, as much as the course, that suppresses times. Still a boy can dream can’t he?